Beyond providing data for all 32 NFL teams, PFF also supports network broadcasters with game-preview packets that are used to enhance the in-game experience for fans and viewers. This Buccaneers-Falcons preview features the same information our broadcast partners use for team research and in-game production. Jameis Winston isn’t afraid to chuck it deep. Throughout his career, he’s attempted a deep pass (20+ yards) on 12.6% of his attempts and earned a passer rating of 89.3. have combined for 17 deep targets this season, with more than 20% of their targets being 20 yards or more downfield. 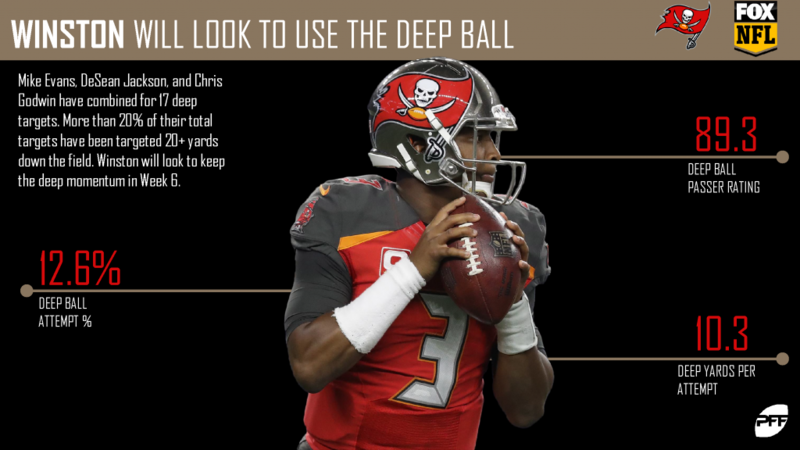 Winston will look to keep the deep passing game going in Week 6. 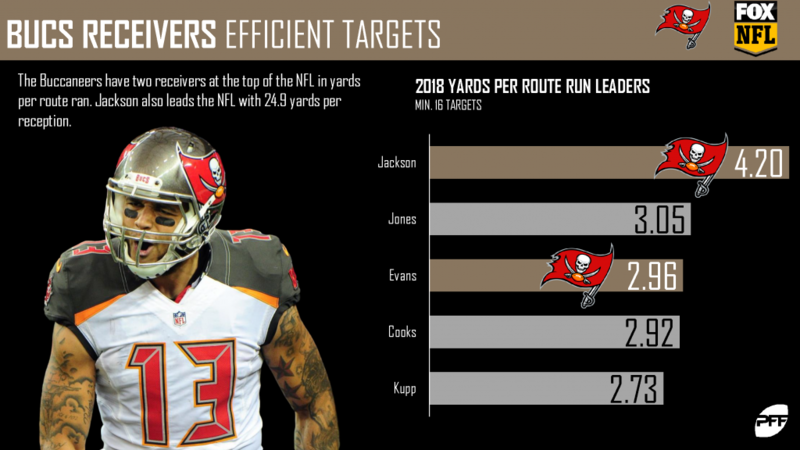 The Tampa Bay receivers have earned the second-most yards (399) as a group on deep targets in the NFL this season (behind only the Atlanta Falcons with 417), and their 99.3 yards per game on deep passes leads the league. As a result, the team has two receivers at the top of the NFL in yards per route run. Jackson leads the way gaining 4.20 yards per route run, while Evans ranks third at 2.96. It has been a somewhat strange start to the 2018 season for interior defender Gerald McCoy. 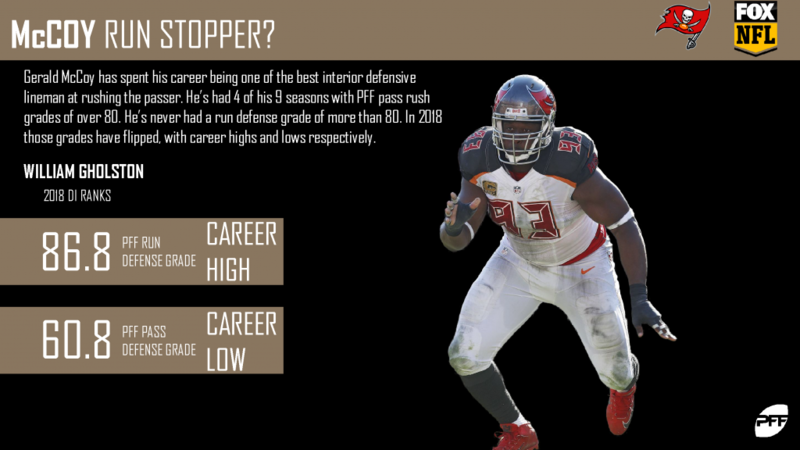 He’s spent his career being one of the best pass-rushers at his position and has received an 80.0 PFF pass rush grade or better in four of nine seasons. While he’s achieved those marks, McCoy has never earned a run defense grade of more than 80.0. However, those grades have flipped this season. McCoy’s pass rush grade of 60.8 ranks 52nd, while his run defense grade of 86.8 is 8th best among interior defenders. 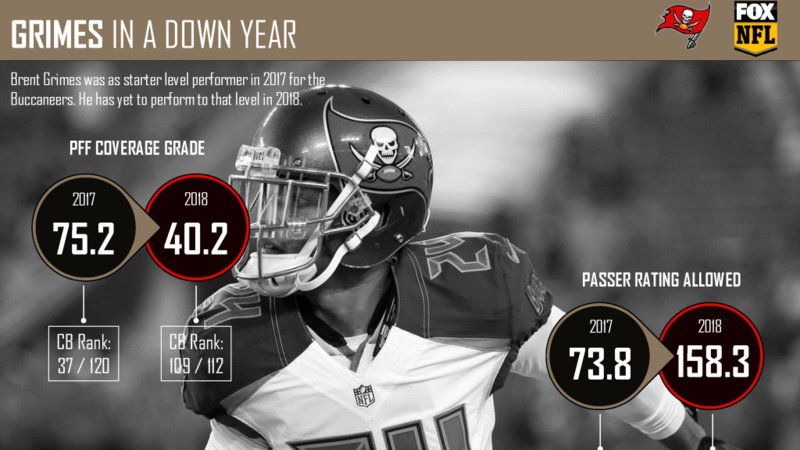 Brent Grimes was a starting-caliber cornerback last season in the Buccaneers’ secondary but has declined considerably through four games this year. Grimes earned a coverage grade of 75.2 a season ago, which ranked 37th out of 120 qualified cornerbacks and he allowed a passer rating of only 73.8. The drop off in 2018 has been significant, as he’s allowed a perfect passer rating of 158.3 so far this year. 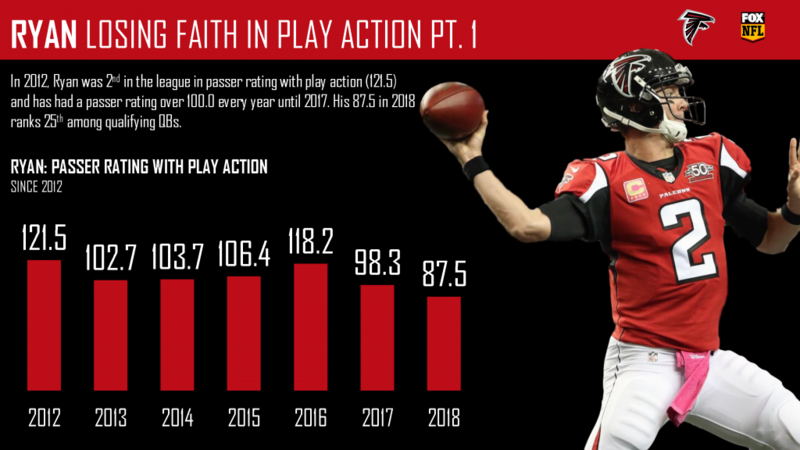 Throughout his career, Matt Ryan has excelled while using play action. This season, however, has been somewhat of a different story. Ryan’s rating has dipped to 87.5 which ranks 25th among qualified quarterbacks through the first five games. Calvin Ridley is enjoying tremendous success in his rookie campaign. 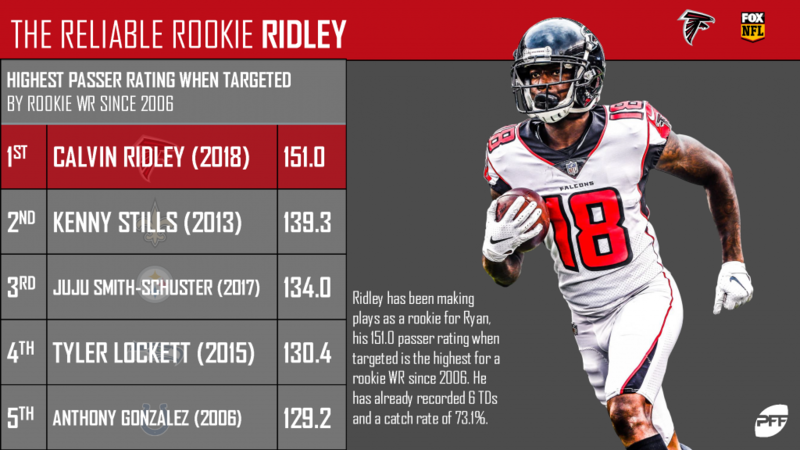 Through his first five games, his WR rating of 151.0 ranks first among all rookie receivers in the PFF era and currently ranks third among receivers this season. 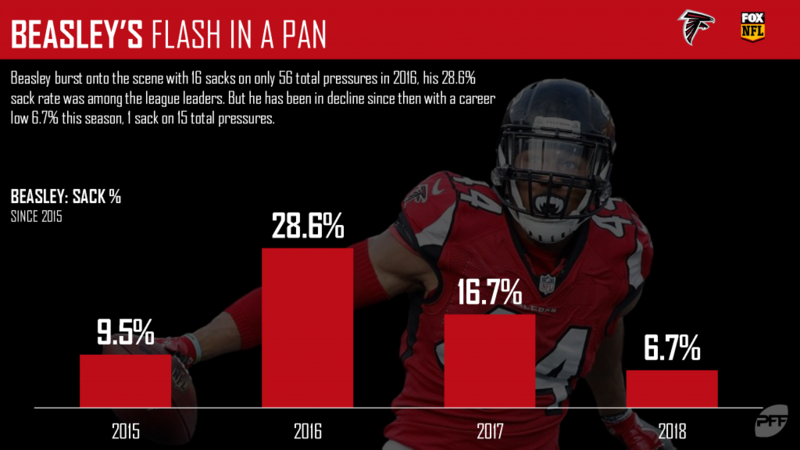 Vic Beasley Jr. burst onto the scene with 16 sacks on only 56 pressures in 2016, and his 28.6% sack rate was among the NFL leaders. Since then, Beasley has declined considerably with his current sack rate of 6.7% being a career low so far. In five games, the edge rusher has produced only one sack on 15 total pressures. 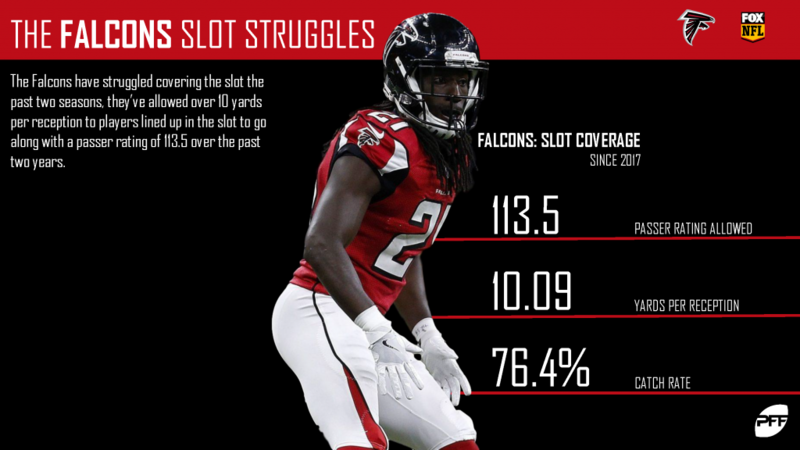 Since the start of the 2017 season, the Falcons’ defense has been vulnerable in slot coverage. Atlanta’s secondary has allowed a passer rating of 113.5 and over 10 yards per reception to players lined up in the slot during that span. 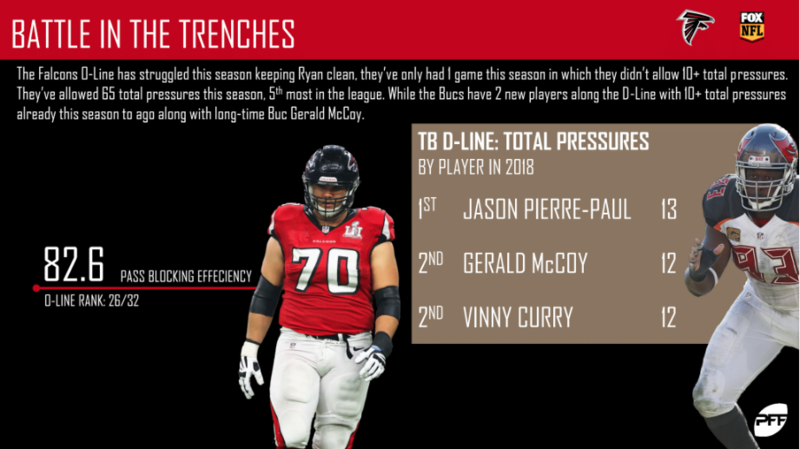 PFF Greenline has projections for the spread, moneyline and over/under of the Buccaneers’ matchup with the Falcons. Get its picks here.